Can't believe I'm doing this. Grey goose gets let go on account of shrinking space and relative lack of use winning over sentimentality. I love this bike - it's my first roadie - so it's been super cared for and babied but absolutely not sheltered. GREAT candidate for restoration - repaint, new decals, you're in the grand with a super classic racer that can still hold its own with the new bikes today. Weighs near 20# as is without pedals. And yeah - it's made in the good 'ol USA. Dura Ace 7402 cranks, rear derailleur SANTE front derailleur Suntour downtube shifters 105 brakes, Tektro levers Generic stem, Belleri track bars Alien carbon seatpost Fizik Arione saddle Front rim: 32H Campagnolo Omega strada hardox aero clincher bladed/radial lacing Rear rim: 32H Campagnolo Omega strada hardox aero clincher bladed radial non/drive side and 2x DB drive side 600 hubs 7 speed cassette (?? 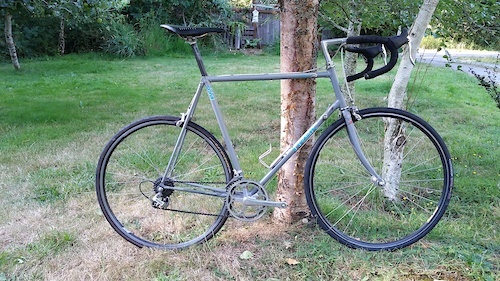 make/model) Bike located in Friday Harbor but willing to deliver a reasonable distance on the mainland if necessary. Ventana Marble Peak FS 21"